CoaXPress is the most recent addition to data transmission standards, opening up new possibilities within industrial machine vision. CoaXPress is a perfect match for the latest CMOS and CCD sensor releases, complementing traditional interfaces, where transmission bandwidth is increasingly being challenged. With 6.25 Gbit/sec. transmission rate over a single cable, this interface makes transmission of even higher resolution images at increased frame rates possible. Aggregating several cables in a system easily facilitates doubling (Dual Full, 12.5 Gbit/sec.) or quadrupling (Quad Full, 25 Gbit/sec.) the transmission rate. 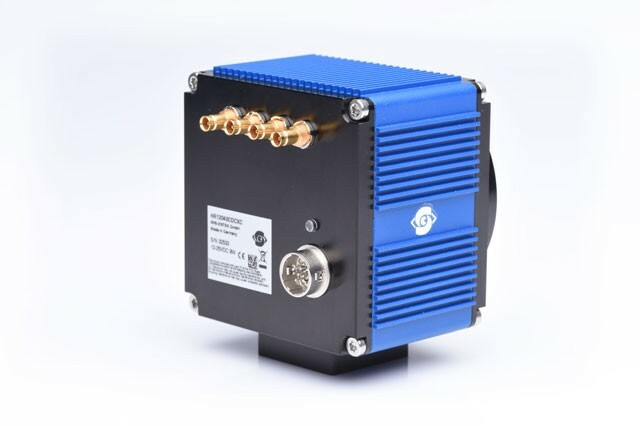 Well-established coaxial cables and BNC or RF connectors, standardized by the broadcast industry, are once again coming to use within industrial machine vision. The CoaXPress standard was first unveiled at the 2008 Vision Show in Stuttgart. The physical medium used for data transmission, coaxial cables and BNC connectors, has a much longer history. In the fifties, transmission of analog video over a 70 Ohm terminated cable had its beginnings. The signal was identical in frequency to the ether-bound broadcast transmissions: NTSC in North America, PAL in Germany and most of Europe, and SECAM in France. Still today, these cables with a legacy from the analog era are found in various infrastructures. Consequently, broadcast institutions are riddled with these single core cables. Monitors in the professional arena and in the entertainment industry are connected with BNC cables. Many security and surveillance systems for the retail locations, such as shops and gas stations, still rely on coaxial cable and BNC connector technology. In many cases, the transmission standard used with these cables and connectors no longer relies on analog modulation. SDI is rapidly taking over in the digital broadcast world for transmitting high-resolution uncompressed video. The Society of Motion Picture and Television Engineers (SMPTE, a standardization body, similar to AIA, EMVA or JIIA, but for the broadcast industry) initially ratified SDI in 1989 as a digital standard for digital video transmission over single lead cables. Differing from CoaXPress, audio signals also needed to be accommodated. This was integrated, together with other additional information, in the time between lines or frames (blanking time, originating from cathode ray tube technology). 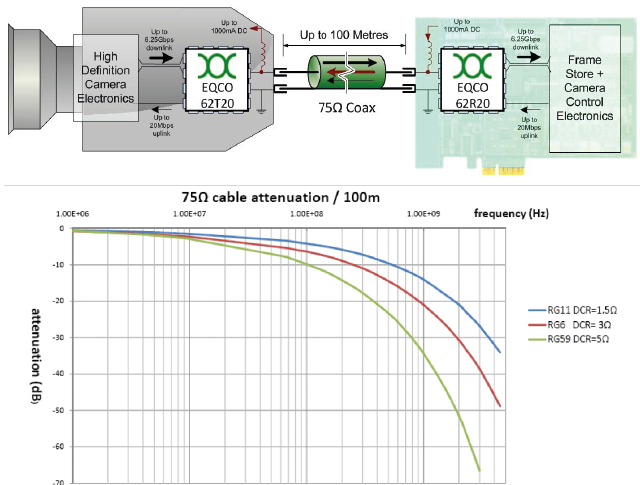 Transmitting over a single core cable has its pros and cons. One of the major advantages is the effective shielding of the core that can be realized. This allows transmission of GHz signals over great distances. The core diameter and characteristics of the cable are crucial factors for the transmission properties of a coaxial cable. Further, the material choice for the isolation layer (dielectric) plays an important role. The ideal material is clean and dry air, resulting in 75-Ohm impedance. (In comparison, using polyethylene as a dielectric, results in 50-Ohm impedance). In CoaXPress, data is transmitted at packets. The packet payload comprises image data and additional bits for validation and synchronization. The retransmission of lost or corrupted data is not foreseen. Interfacing to the host PC is realized with a special frame grabber. 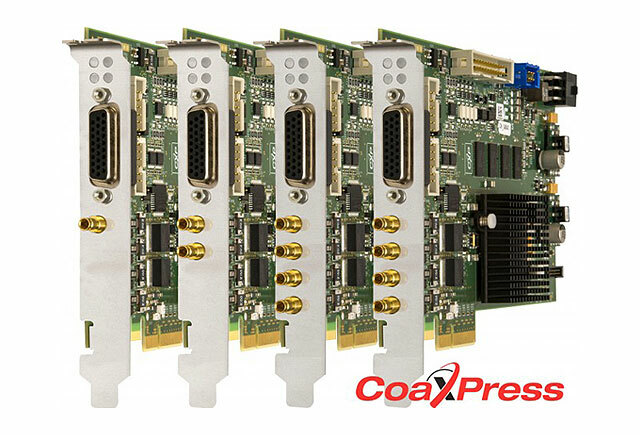 Our long-standing partner for frame grabbers, Euresys, offers a complete series of PCIe expansion boards, capable of providing the full bandwidth of 25 Gbit/sec. for your CoaXPRess implementation. CoaXPress accommodates an UpLink channel with a fixed data rate of 20.833 Mbit/sec that can be used for camera configuration and control, triggering and firmware updates. Should higher UpLink speed be required, a dedicated cable can be implemented providing the full 6.25 Gbit/sec capability. In addition to transmitting digital video, CoaXPress can also provide power to the camera. 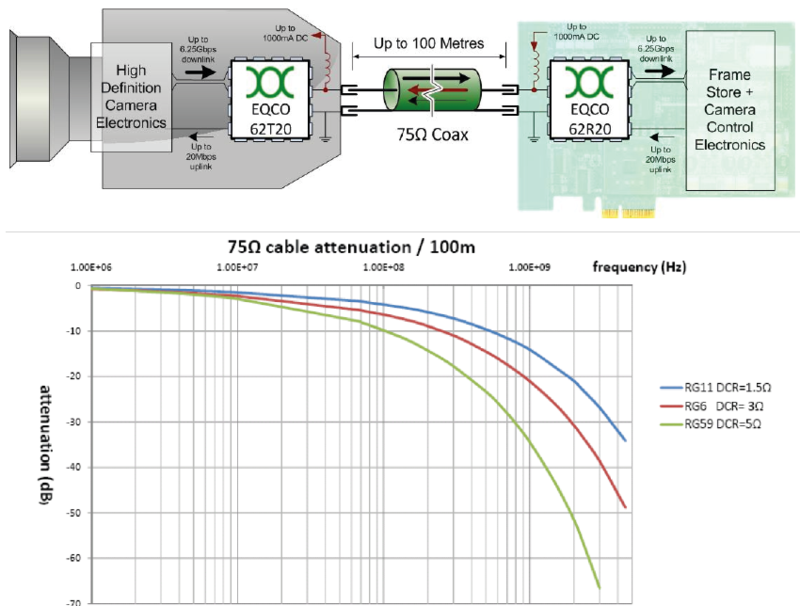 A constant 24V DC voltage is applied to the cable core, without influencing the signal integrity. The Pro solutions are able to power cameras with up to 13 Watt (at max 1 A). Feel free to contact us so we may help you optimize your specific solution. 5 megapixel = 40 Mbit/image. This translates to 156 frames/sec. 12 megapixel = 96 Mbit/image. This translates to 65 frames/sec. 25 megapixel = 200 Mbit/image. This translates to 31 frames/sec. For CoaXPress configurations with several cables, a dedicated UpLink connection with up to 6.25 Gbit/sec. can be designated. Cables and connectors in versions with several leads can be consolidated to a single cable.